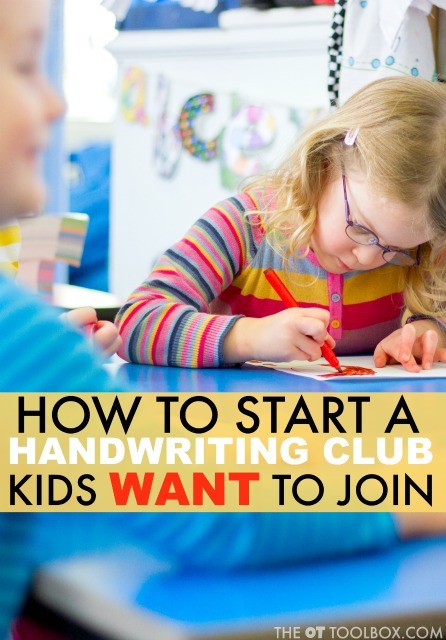 In this article, you'll discover how to start a handwriting club for kids to develop and enhance the skills needed for legible handwriting. Create a Handwriting Club as an after school program, an in-school activity, or as a home program idea. A Summer Handwriting Club is a great way to prevent the summer slide in handwriting skills in fun ways and using multisensory strategies to get the kids excited about practicing handwriting skills. A handwriting club can even be implemented as part of the RTI process. Why Start a Handwriting Club? Occupational Therapy practitioners know the importance of learning handwriting skills for children. They understand the necessity of learning pre-writing strokes and shapes prior to attempting letter formation and numeral formation and they understand the importance of proximal to distal development in order to provide the best foundation for a child to be the most successful. Handwriting is a complex skill and requires many components to generate legible written output. When handwriting instruction is overlooked, some children will struggle with letter forms, legibility and writing speed. It is important that handwriting be directly taught with a targeted focus and monitoring on body preparedness as well as formation patterns. When handwriting becomes automatic, children can focus on other aspects of writing such as grammar, planning, punctuation, composition, and self-correction or revision. A fun handwriting club may be just the ticket for some children who experience more difficulty with learning handwriting due to a poor foundation. 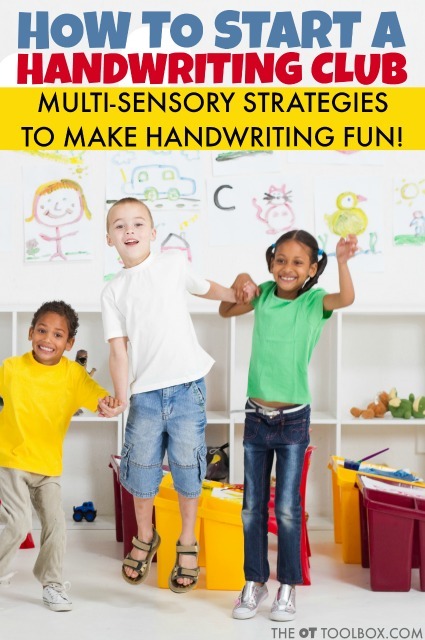 A handwriting club can provide direct instruction in body preparedness and formation or mechanics that utilizes sensory and motor activities to facilitate the learning process. 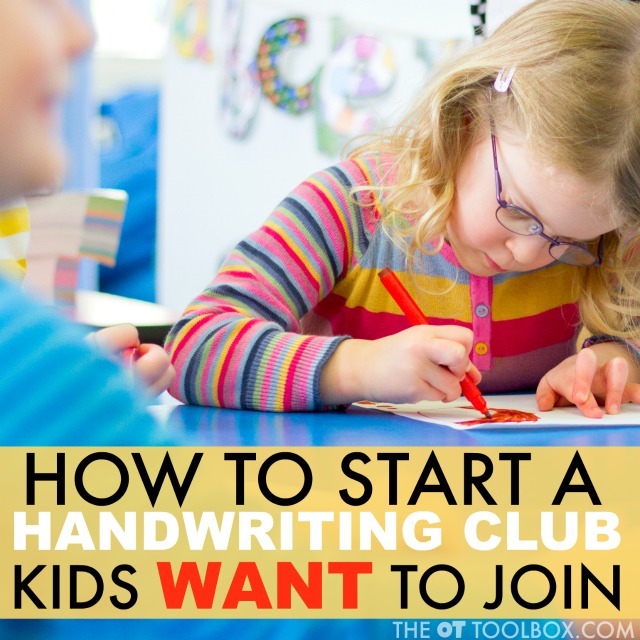 This post will help describe the steps to organize and implement a simple handwriting club. 1. Determine the purpose of the club. Will it target prewriting, upper case formation, number formation, lowercase formation, cursive formation, mechanics of handwriting such as letter size, letter placement, line use, spacing, etc.? 2. Determine your target group and the goals you wish to achieve. 3. Determine the handwriting resources or programs you wish to utilize such as Handwriting without Tears, Size Matters, Loops and Other Groups, First Strokes, Fundanoodle, etc. 4. Decide the club agenda or sequence of club activities – always begin with body preparation in gross motor to fine motor and then proceed to handwriting content. This will be based on the length of time for the session. Later in this article, I will provide an example of a formation handwriting club agenda. 5. Collect and prepare the materials you will need to implement the activities of the club. 6. 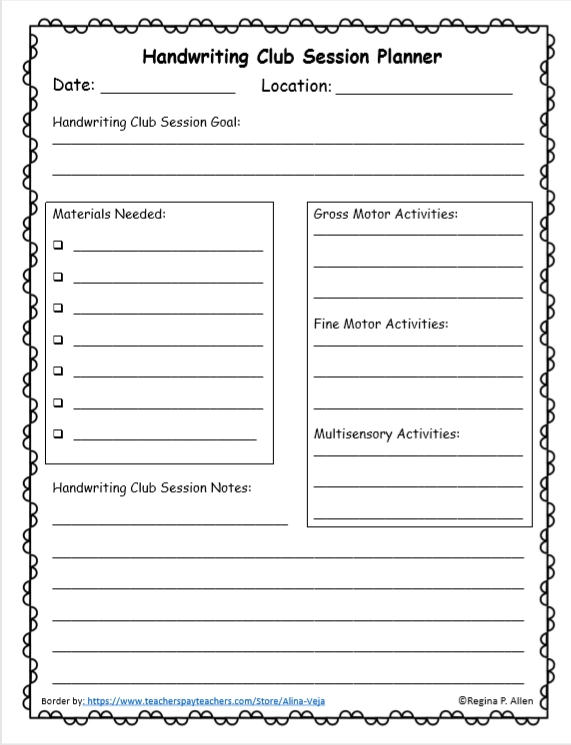 Create any parent information sheets explaining the purpose of the club and any homework expectations. 7. Prepare any homework materials. 8. Determine the exact day(s), time(s), duration, and location of the club. 9. If you want, decide the name of the club or this could be part of your first session. 10. Finally, begin the club meetings. 11. At the final session, present children with certificates of completion. By experience, a fun club name could provide the “just right” motivation for participation. Having children create a secret club name appeals to their sense of mystery and fascination. Another fun element could be using special accessories that are worn only during the club meeting time. An example would be dollar store glasses (with lenses popped out if needed) in which children wear only during the club time. Having a secret club handshake as the greeting can also make it more interesting and appealing for children to engage in the club. What Happens in a Handwriting Club? Step 3: Approximately 5-7 minutes. Follow with beginning instruction in formation. (This time could also include a review of previous letters learned.) The formation could be upper case, numeral, lower case or cursive letter focused. Utilize verbal and visual strategies placing yourself appropriately in order for children to see from their handwriting viewpoint. Instructor demonstrates formation with emphasizes on start point and sequence utilizing verbal and visual cues such as those in the Handwriting without Tears program. Use the board and air writing format. Follow with air writing imitation for children as they follow verbal and visual instruction. Instructor should monitor child arm movements to ensure correct start and sequence pattern. If needed, provide hand-over-hand guidance to facilitate the correct motor plan. Once confident in gross motor, shift formation with children to finger writing on the table top while children verbalize steps and instructor monitors finger movements to ensure correct start and sequence pattern. If needed, provide hand-over-hand guidance to facilitate correct motor plan. Step 4: Approximately 10 minutes. Provide further multisensory activities to practice formation before moving to paper. Change the medium with each session, if desired. Step 6: Approximately 3-4 minutes. Once letter practice is complete, explain and issue any materials or information sheets that you plan to send home in order for parents to support their child’s club participation. 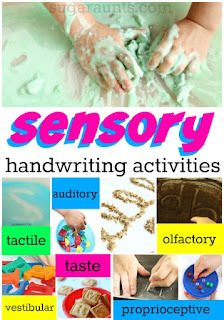 Sensory Handwriting Activities add multisensory components to learning letter formation. 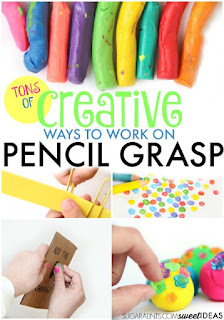 Use creative fine motor and play activities to promote a better pencil grasp. 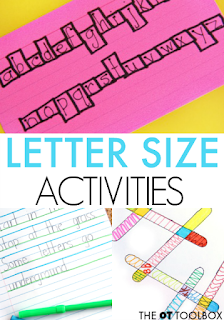 Work on letter size with fun and creative activities. 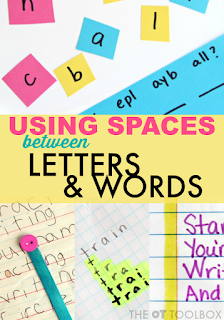 Promote and boost spatial awareness in handwriting for consistent use of spacing between letters and words with creative (and memorable) activities. A Handwriting Club Makes Handwriting Practice Fun! A handwriting club such as described in this article can help generate enthusiasm and make handwriting fun for children who struggle or need additional support in developing the foundational skills necessary for future handwriting success. A fun club makes it seem less like dreaded handwriting work and more like special-time fun with friends. A handwriting club can provide the much time needed for children to develop essential skills in foundational body preparedness as well as handwriting acquisition. Included with this article is a free Handwriting Club Session Planner and a list of possible Handwriting Club Activities including gross motor, fine motor, and multisensory activities, all which could be used during club meeting times. Get it by entering your email address below. If you are already a subscriber to our newsletter, you will still need to enter your email address. This is simply so we can deliver the PDF file to you. Get the Free Handwriting Club Session Planner! You will also be added to our newsletter subscription for weekly tips and tools in your inbox. You can unsubscribe at any time. Get the Handwriting Club Planner!